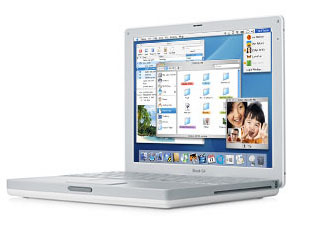 The 14.1" models consumed 51 W of power, weighed 5.9 pounds, and had the following dimensions: 11.2" W x 9.06" D x 1.35" H.
Introduced in October 2004, the iBook G4 (Late 2004) was essentially a speed-bump of the existing iBook G4 (Early 2004) line. All models received faster processors, the low-end model got a price cut, the mid-range model received a larger hard drive, and the high-end model optical drive was upgraded to a SuperDrive. The iBook G4 (Late 2004) shipped in 3 configurations: 12.1"/1.2 GHz/256 MB/30 GB/Combo Drive/$999, 14.1"/1.33 GHz/256 MB/60 GB/Combo Drive/$1,299, and 14.1"/1.33 GHz/256 MB/60 GB/SuperDrive/$1,499.